Do you ever shy away from sewing fashions, since getting the right fit may seem daunting? Don’t worry—you’re not alone. During the next two Sewing With Nancy episodes featuring the new show, Solving the Pattern Fitting Puzzle, I’d like to share with you my favorite pattern fitting techniques that are easily mastered without cutting the original pattern pieces apart! 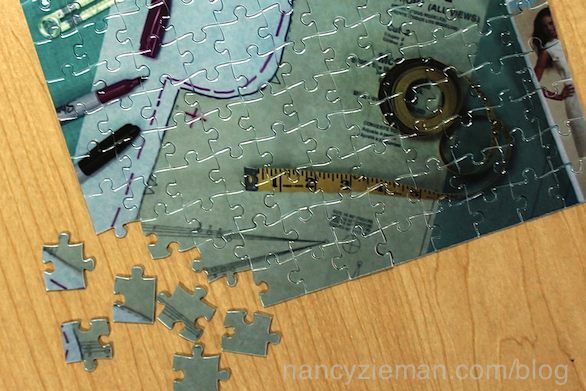 Fitting sewing patterns can be approached as if you’re putting together a puzzle. 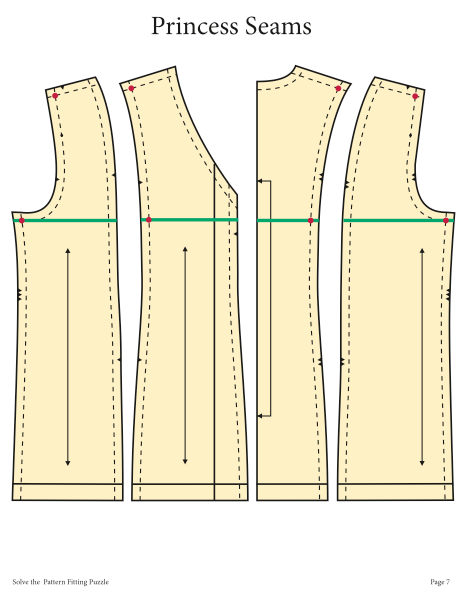 In Solving the Pattern Fitting Puzzle, Part One, I’ll cover the fitting basics; bust, waist, and hip adjustments. 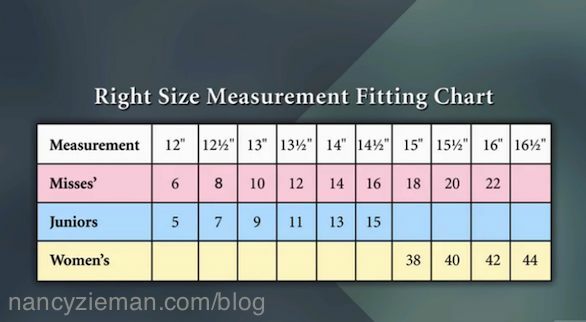 Learn a new approach to choosing the right pattern size with my Right Size Measurement Fitting Chart. 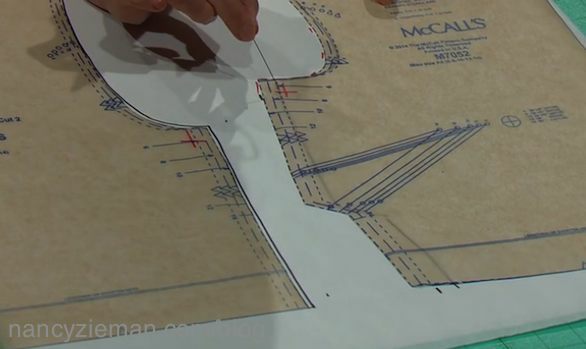 See how to easily measure and choose a basic pattern size. Then learn how to change the pattern with simplified pivot and slide techniques. 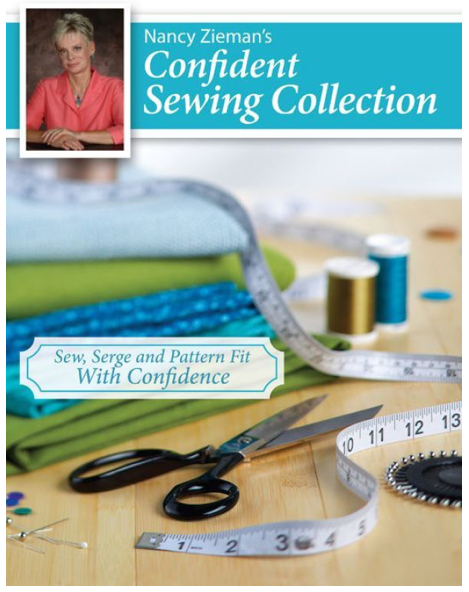 You’ll find all my pattern fitting techniques within my book, Confident Sewing Collection. You can also practice these skills using mini-pattern pieces that you can download for free. 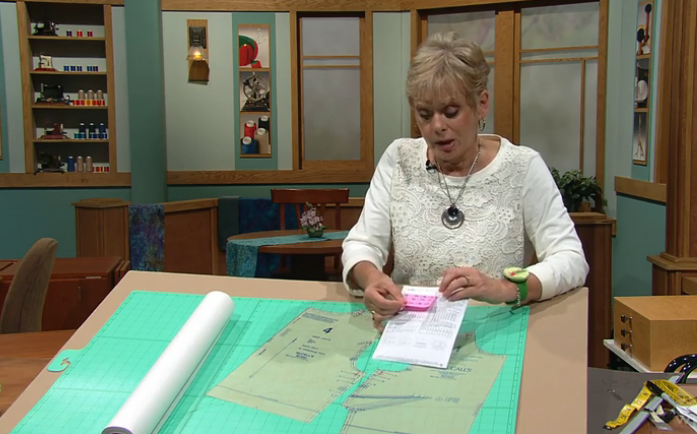 Watch Solving the Pattern Fitting Puzzle on Sewing With Nancy online. Then, tune in next week for Solving the Pattern Fitting Puzzle, Part Two. 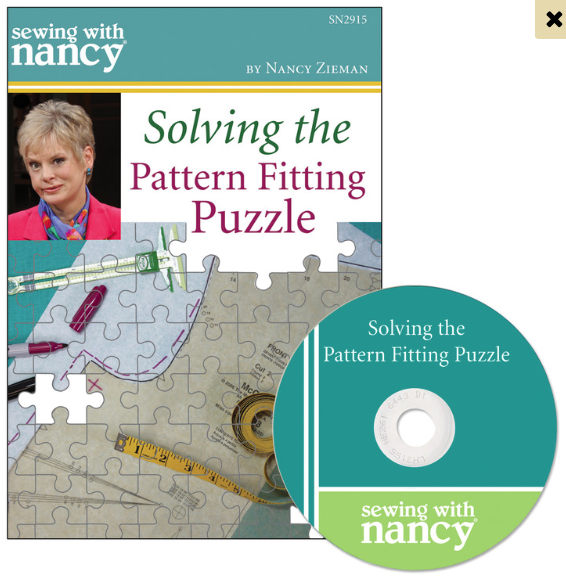 For a chance to win a Solving the Pattern Fitting Puzzle DVD, from Nancy’s Notions, please leave a comment below sharing your pattern fitting puzzler. 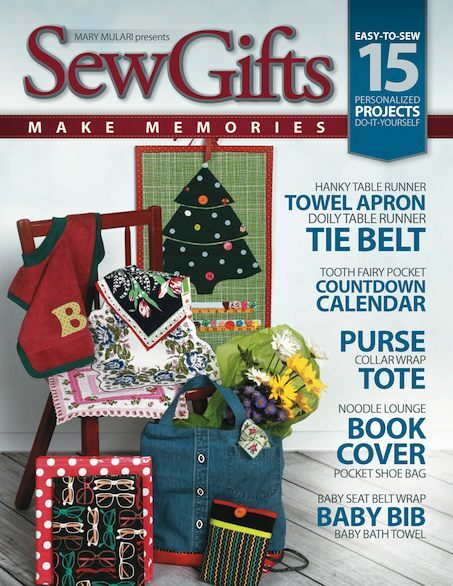 The random winner of a copy of the book, Sew Gifts—Make Memories by Mary Mulari, is Nadine Nakano, who shared, “I have a huge box of old jeans that I want to upcycle so I’ll use a lot of it for the holidays as gifts”. Don’t forget to submit your holiday stocking in my Stocking Challenge! The deadline to enter is MONDAY, December 7, 2015. Click here to see how to enter. Make sure you are subscribed to my enews mailing list so you won’t miss a thing. Sign up here. My size has changed due to a thyroid condition and I have lots and lots of patterns that I love and need to alter. Nancy, your books are wonderful! Have a large bust but a small frame. Fitting is always a problem. Would love help with this. 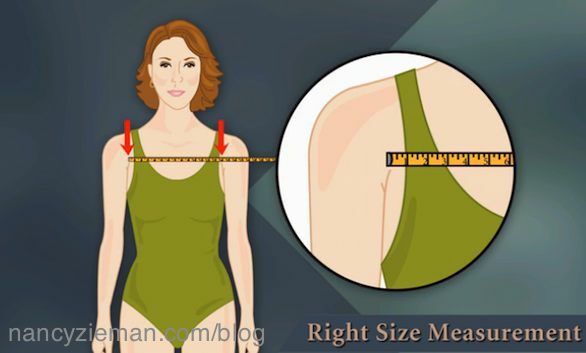 Where can Right Size Measurement Fitting Chart for men be found? Patterns for men are rare and the sizes on the back of the pattern are only in Small (34-36) Medium(38-40) & Large (42-44). I need to have a more specific measurement to determine how to adjust the pattern accordingly. Your assistance would be most appreciated. Please help. Betty, unfortunately, I am not an versed in sizing patterns for men. I am sorry that I can not help you. any longer, however I understand vɑгios other buddies who ‘d like this. Lana, I don’t know the answer as I have not worked with Seamwork. Perhaps you could contact them to see how their sizing correlates with the standard McCall’s and SImplicity sizing. I have used this method for many years, since Nancy introduced it. Love it, and find it works well for me. I am petite and struggle with making tops that fit across my shoulders without gaping at the top, mid back while maintaining the correct bust size. Would love tips! As always, great tips! I have been a fan of your pivot and slide method since the 1980′s when I ordered your project sheets. It has been my go to method for fitting in garment construction ever since. I used my “right size measurement” for a shirt I’m making pinned it together & it actually looks like it fits. I also found a great way to duplicate pattern pieces purchase table cloths made with dunicel (Berkeley Jensen) makes them 50″x108″ (127cm x 274.32cm) they come 2 in a package. Acts like fabric much easier to handle than tissue paper. Thank you so much for these programs about pattern alterations! I learned a great deal from the book you published in the 1980s, and it’s great to have a refresher and some updated techniques. My problem adjustment is altering for very plus sized women (I build costumes for community theatre), particularly modifying for DD+ busts while keeping the shoulder/armhole from being too large on standard and princess bodices. I would also like to know how to draft a trouser pattern for a protruding bottom, without making the trouser leg far too wide. My bust is smaller than it should be to be in proportion with my waist. Also waist not in proportion to hips.Then there is the problem tummy now that I’m 81, which doesn’t help. When I was much younger, I wrote McCalls pattern company about this problem and got no real help as they suggested a woman’s pattern size that was MUCH too large (I weighed 130 then) and too short waisted (I’m 5’8″). Lord only knows what they would suggest now! I need help in the worst way! I am overweight due to the steroids I must take to keep my illness in control. Nothing fits, including store bought clothes. Your method will surely help to solve my fitting problems. Hope you are feeling better. Have a blessed Thanksgiving. I have a rounded upper back and a large tummy. As I’ve aged nothing fits ready to wear or pattern made. The videos were very helpful and I think the book might give me the rest of the answers. Narrow shoulders and generous hips. I always look forward to your emails. Thanks for the continued work you & your staff do. As you can see, you’re a blessing & inspiration to many of us here. Continued success & health to you. I want to sew for my beautiful niece, however, she is tall & hippy & I usually sew for the beanpole type grandkids. Thanks! I have never been formally taught how to fit patterns correctly. This information is fabulous!!! I always struggle with the bust and the arm holes. Wow this is so helpful. I learned to sew from my mom who was an amazing seamstress. I found two old dress patterns of hers and decided to make a dress for myself using them. It was hard to fit correctly because she was bustier and shorter waisted than I am. Fortunately, I was able to “make it work” and the dress was beautiful but this info would have made it much easier. Thank you. Blending sizes some times causes my problems. I found a pattern that I like; however, the largest size is several sizes to small for me. I would love to be able to make the adjustments. Most patterns today have sleeves that are too small to fit my arm. I can’t see how they think a woman with a 40″ bust has a less than 14 1/2″ arm circumference. It’s frustrating and cutting the sleeve apart is messy and hard to work with. Thank you, Nancy! Your pivot points were an epiphany; especially for the armscye! I will also use your method for moving the dart! I look forward to Part II! One of my pattern puzzlers is narrow, very square shoulders. 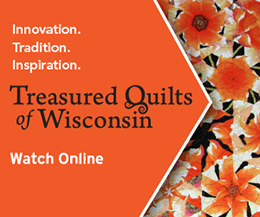 I’m so happy to see a program on fitting patterns! Thank you. I weigh 136#. I have narrow shoulders, thin neck, but ample chest. I have loads of problems finding RTW tops and blouses that don’t have gaposis at the neck along with hanging down armpits. If I find something that fits my shoulders it is invariably too tight in the chest. I hope you will address (if any) differences in altering a knit pattern. Thx for doing a couple shows on altering patterns. My copy of your fitting book from years ago is now falling apart – several pages are no longer attached to the spine. I’ve used it so much and it has never failed me. I expect the new one with the DVD will be even better! I need help! Petite, large bust. If bust fits, armpits are huge. This was very informative and since are ASG Group is now working with 4-Her’s this will be a very helpful video on Pattern Fitting. Thanks for your sharing and teaching us. As I age and shrink in heighth and expand in the tummy, I have a terrible time buying clothes and would love to make my clothes again. This method could be my answer. Being a large woman I find there are few patterns available. Mostly what I get is “lose weight”, but I have proved it’s due to real medical reasons. Still, I would like to dress nicely and make my clothes. I have to enlarge everything except a few patterns which I have to alter to fit, and it’s not always easy of successful. I would love to have the confidence to just adjust and cut out without the worry that I’d doing it right. 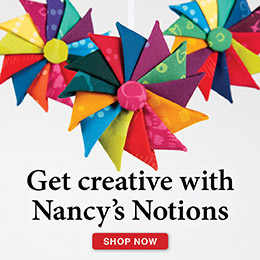 I love the method you use for fitting Nancy! I is so simple and effective. I would certainly welcome this into my library. Praying for your full recovery Nancy. As my body has changed with age I am faced with new/different fitting challenges. Thanks for the refresher course and reminder of ways to tweak the fit that I did not need to do when I was younger. Isn’t it amazing to see how many posts, just how many of us, no matter how much time and energy and expense we put into fitting, continue to be disappointed. Something is totally wrong. I’m hoping with this method, the mystery of fit will be resolved, once and for all. My body and pattern sizing has changed has changed from when I used to make all my own clothing. Would enjoy gaining confidence in choosing pattern sizes that would fit now. I use to make all my clothing and never had a problem of things fitting. I have just started to make some tops for myself again and they never end up fitting. Not sure what I am doing wrong or if patterns have done some size shifting. Thanks for the great giveaway. I am short and have wide shoulders and a small bust. It is very hard to find patterns that fit. We are hoping you will soon be healthy. Since God “blessed” me with a generous bust, I must alter patterns to fit. I haven’t found a reliable method, but this method seems promising. I would love to win the DVD so I can finally make a blouse that fits properly. My daughter and granddaughter are ” blessed” also, so all three of us will benefit from this lesson. Thanks for all the lessons you have shared. My problem is finding the right waist measurement…I pick the pattern size for the bust, but then for a blouse or dress…I cannot figure out where to adjust for the waist to hip…I thank you for a great giveaway…..
I’m presently challenged with fitting an armhole and a short sleeve. On top it is solving the “hanger” area of my narrow shoulders & neck but then being able to scale out for the large bust, tummy, hips all while keeping the armscye area neat and smooth. On the bottom I’d love to get rid of smiles & frowns by perfecting the crotch length & depth… and waist…. um, where exactly is my waist?? They either stay up right under my bust or hang on my hips. My rise is then too short… teen low rise jeans come up to my belly button. Larger bust + narrow forward rolled shoulders + narrow ribcage + shortwaisted + waist < 11 inches than hips + momtum = FIT CHALLENGED. Pretty excited about this new program! I’m trying to understand that I need to pick a pattern for my high bust measurement, and then grade out for bust & hips. But so far, all my efforts have resulted in shoulder seams that fall off my shoulders, and often too wide neck openings. I’m baffled about what I should do if I just cut off the width at the shoulders – do I need to change the sleeves then? So I’m definitely puzzled. I have been trying to find a pattern that really fits, I am overweight and its hard to find patterns that really fit right. Fitting pants is my biggest puzzler! I used to make my kids clothes. I have not seen me anything for years because I am a plus size and I just don’t get it! HELP! Thank you. I would love to learn how to fit tops in the underarm area so that the lay is right across the bust and drapes nice. My daughter could sure use this! Great info. I really need this. I have to agree with the other comments that getting older makes fitting a much more difficult job. I know how much I appreciate you tackling this problem and would love to win this. Many years ago I learned from you the alterations you show in the Part 1 video. Now that I’m older and a “little” fluffier, I need to learn how to make an adjustment for a fuller bust line. I can’t tell you how difficult it is for me to make any garment that has sleeves. The size of my arms are at least two sizes larger than my bodice. They are this large all the way from shoulder to wrist. I wear long sleeves to camouflage them. I am just tired of gathered sleeves. I am experienced at making my own clothes since age 10. But I am baffled by this problem. Thanks for helping so many people. I pray that God will heal you so you may keep up the good work. You are very fortunate to have so many people who love you, including me. I’m a beginning sewer. I signed up for an online class on pattern fitting and I had a hard time understanding what was going on. I’m definitely interested in seeing your show on fitting. Some day it would be nice to make garments that fit well, instead of just fit on. I am very excited to learn a way to fit pants. I have a large waist, smaller hips, no behind and average sized legs. My problem is if I make a pant to fit my waist they are huge in the hips and legs. If I make them for my hip size then they are too small in the waist. Help!!! Thank you. My fitting problem: small frame and DDD bra cup size. This summer I made a dress for my son’s wedding. The size I selected was too big on the top and too small on the bottom. With the help from my husband I was able to make a beautiful dress but I would like to have a good guide for future projects. Am I relegated to dolman sleeves forever because as I’ve aged I developed rounded shoulders and a nice set of ‘bat wings ‘ on my upper arms but stayed the same width armpit to armpit. I’ve stopped making clothing altogether because of the fitting problems I’ve encountered. I would love to make something besides pajama bottoms! I used to be able to fit myself well, but now that I am older and a little larger, I am very uncertain. I usually allow too much extra fabric. Nancy’s methods should help me a lot. I am totally intimated when it comes to fitting clothing and I have given up. Thank you so much for the wonderful instructions; they give me renewed hope. I hope it will be me but congratulations to whomever wins the DVD; this will be an invaluable help. Just what I have been looking for. I have stayed away from making clothing for myself because the fit is never right. I usually have a dummy pattern cut out first using what ever paper I have on hand then I piece it onto the person I ma making the piece and do any alterations that way. Time consuming but its easier than trying to cut a semi finished piece and making mistakes that are not reversible. I have been using your methods for years and recommend them to all of my students who are afraid of making clothing because of fit issues. Thank you for providing such a straightforward way of fitting. And thank you for being so humble in your approach to sharing your knowledge. You are a blessing and inspiration to many more than you will ever know. I used this method many years ago, making prom dresses for my daughters. The sizing really works! I am delighted to see it again as I am interested in making some garments for myself. I had wondered if the sizing charts had changed with patten sizes. Now I have a recent version to update Nancy’s book from years ago. If you sew clothing, YOU NEED THIS! I wish the pattern companies would write the finished garment measurements (bust, waist and hips) on the envelopes. That would at least give us a fair chance to buy the right pattern size to start with. Sometimes I have to start with a size 10 sometimes a size 14 and work from there and that is within the same company’s pattern. They don’t make it easy for us from the start. 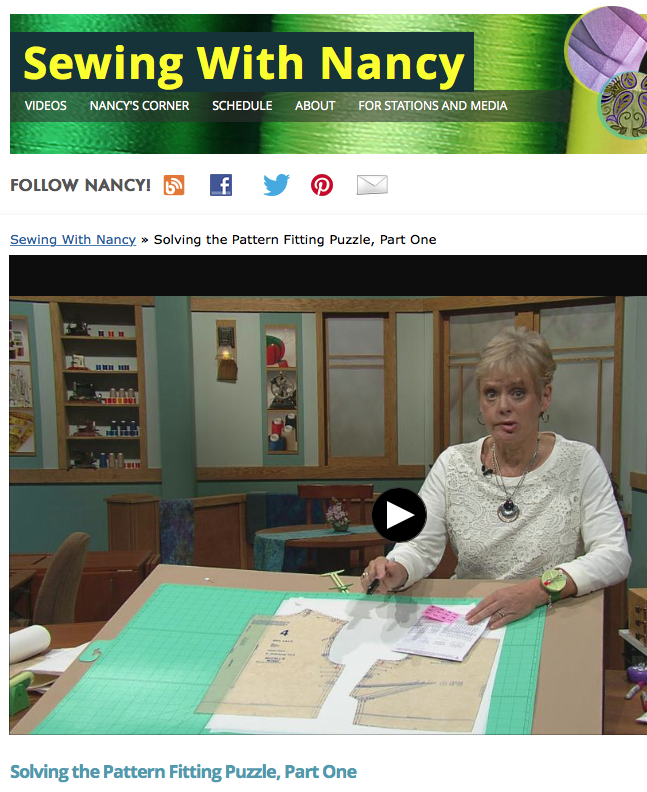 I love the method Nancy teaches in her book Pattern Fitting with Confidence. It is one very dog-eared book in my library. I look forward to watching this 2-part series very much. I’ve been sewing since age 12 (4 H) and look forward to continuing my sewing education. Sewing with Nancy provides that outlet. By the way been sewing for 55 years still passionate about sewing! What a great method! I am constantly on the lookout for ways to improve the fit of my garments. Thanks for the tips — just starting to learn to use patterns. When I sew, I choose the size I think I need and don’t do any alterations because I really don’t know how. If the item fits, great, if it doesn’t, I put it in the pile of scraps. I have wasted more fabric that way. I love when I get something to fit! I am sure the DVD would be a big help. I have trouble getting patterns to fit because my bust is smaller in proportion to my waist/hips area. This can be difficult to deal with, especially when dealing with a jacket. I would love to have Nancy’s DVD to help me get through these problems. Thank you for the opportunity! I to have fiddled my pants pattern to fit,I have lost 46 lbs so now I have to refiddle my pattern,but think I have it done,I do not like the side pockets so looked at ready to wear and figured the pocket like jeans pockets, so now I need to do a top pattern,shoulders are to big,I find if if I have a top that fits I can lay my pattern on that (as I do not have a sewing buddy)and get the pattern to fit, thanks for all the,help,have been able to use up fabric and put it to use,always makes us feel better! My number one sewing issue. This info is just what I need. Can’t wait for Part 2. Thank you Nancy. I’ve learned over the years to make pants that fit, but still have problems with shoulder and bust fitting. Other than knits ready to wear for me is virtually non existent. This video would be a big help. I like to make jackets, but often have to give them away because the shoulders don’t fit. I also have trouble getting the bust fitted properly. Fitting pants is tough. Choosing the correct pattern is tougher. I am finding it impossible to get my sewing patterns to fit as I get older. This book would be a huge blessing. Finding clothes that fit well and modestly in stores seems to be impossible also. I’ll have to give this a try! I used to sew most of my own garments & for my kids. Now that they are grown and my figure is no longer a ‘standard’ size, not so much. I would really like to start again and solving the fit issue would be a great help. I’ve promised my daughter I would try to make her a jacket or two that actually fit. This book is the tool I need to get started. I really need to watch this episode. Fitting issues where should I start. I have very narrow shoulders vs large bust; no longer have a definable waist, normal hips but have a tummy due to 3 surgeries. As I’ve gotten older my shoulders are now curving forward. I purchase a size L & sometimes XL depending on the fit or lack of ease and the shoulders are usually 1 to 2 inches too big. My biggest fitting issue is around the hips and waist. I know your book will simplify and make it all make sense. Thanks, Nancy. When I was younger I no problem fitting patterns. Since getting older everything has shifted and I cannot seem to get the right fit. I would love this program, I have not sewed clothes in 20 years and I am trying to get back into it, I my daughter in law wants to learn to sew so I am teaching her and I would like her to learn the right way of doing things this DVD would really help the both of us. have a great day! I love dressmaking, but stopped because when my body changed, I couldn’t get a nice fit. I think I can do it with your method! I’m excited and can’t wait to see the second video. Thanks! Pants fitting has always been my biggest problem. I have been watching “Sewing With Nancy” for years and have learned many helpful fitting tips. Thanks, Nancy! You are a true inspiration. I have learned so much from you over the year and have many of your older shows on VHS tape. I would love to see a segment on how to adjust the crotch length of a pant pattern, to make it longer. I used to make all my clothes, and they fit perfectly. Now I have grandchildren and nothing fits except rtw stretch and that’s stretching it a bit. With tubs of beautiful designer fabrics I hope your method is my answer. What I would give to have a pants pattern that actually fit ME. . I have a hard time with drop shoulder patterns fit and sleeve lenght alterations. A book with step by step instructions is Wonderful! I have sewn for years but have never taken the time to properly fit a pattern. Thank you for the give away! I have always been hesitant to sew anything but loose fitting garments for myself because even after 40 years sewing I’m unsure how to fit properly. This is an awesome series and thank you so much for the opportunity to win! Sewing clothes that fit was always a mystery. With these techniques, I’ll be willing to try again and get stellar results! Thanks Nancy….you make it sound so simple! I would really like to make clothes for summer and would definitely love to win this to keep referring back while trying to sew. What a great video! Grandma taught me to cut the pattern, and I’ve always been hesitant to do that. I truly appreciate these instructions and can’t wait to see Part II. I cannot get a proper fit, especially since (menopause) I went from a B cup to a double D!!! I never was a “good” seamstress but I enjoyed trying, now I make quilts. I would love to really learn to make clothing that doesn’t’ look home made.. I cannot make clothes for myself!!! I have (since menopause) gone from a B cup to a double D, no matter what I do I cannot get a proper fit – frustrating. I never was a “good” seamstress, but I liked to keep trying, now I make quilts. I’d love this program, fitting pants is traumatizing to say the least! I pray you are doing good, and hopefully walking and feeling much better. Have a blessed day!